What are Germanic Italo Celts???? The word is confusing because when people hear Germanic they think Germany or Scandinavia when they hear Italo they think Italy and when they hear Celtic they think Ireland or Scotland. Germanic Italo Celtic is a branch of the Indo European language family tree and they have their own branch of Y DNA(Marker in Y chromsome of DNA from father to son) R1b their branch is R1b L51. From the studies i have seen it only exists in western Europe and some parts of eastern Europe. The branch that is for sure unque to Germanic Italo Celts is R1b L11 which has two subclades Italo Celtic R1b S116/P312 and Germanic R1b S21/U106 there are also some Germanic subclades of R1b S116/P312 because when Italo Celts and proto German speakers were both in central Europe they mixed but the Germanic R1b S116/P312 subclades are very rare.There is no linguistic evidence that Germanic languages and Italo Celtic languages form their own branch of the Indo European language family tree but that is probably because they have been separate for 4,500-5,000years. Archaeology, modern Y DNA, and ancient Y DNA samples connect Germanic and Italo Celts. Their culture completely dominated Bronze - Iron age Europe from about 5,000-2,000ybp. In my opinion they are one of the most powerful people in history. Evidence is almost 50% of western European men trace their direct paternal line to Germanic Italo Celts this means the native paternal lines were killed in wars. I don't know if there has ever been a people group who dominated so much. It is like their culture never lost any wars till Rome. They are a age in western European history i call it the Germanic Italo Celtic Bronze-Iron warrior age because they spread mainly by conquering. Their age ended when Italic tribes in Italy were Hellnized/Greekifed then the Roman empire. Most of them also converted to Christainty during the Roman empire and alittle after and all of Europe's culture period was completly changed by Rome. Through a mix of R1a1a M417 hunter gathers and farmers from Russia and Ukraine and R1b1a P297, R1b1a2 M269, R1b1a2a L23 north mid eastern farmers 6,000-8,000ybp gave birth to Indo European language, culture, and religion. Some early Indo European groups became dominated by R1b1a P297 like Germanic Italo Celts ancestral languages some became dominated by R1a1a M417 like Indo Iranian Balto Slavic ancestral language. It is hard to say exactly what ethnicity the first Indo European speakers were. Or what languages were started by what ethnic groups what were the people who spread the language like. All we know just about for sure is the Indo European language, culture, and religion started around Russia, Ukraine, north middle east about 6,000-8,000ybp. The R1b that's spread with Indo European languages originally came from the north mid east the R1a from Russia and Ukraine. It seems all Indo European languages even groups dominated by R1b migrated out of Russia and Ukraine. The R1b came to Russia and Ukraine from the north mid east then migrated to western Europe or whatever. There was also probably some central Asia influence since very very early Indo European cultures like Yamna even as far back as 5,600ybp extended to Kazakhstan the central Asian influence could be European, mid eastern, or Mongoloid. We have types of DNA from 5,000 and 6,000 year old Yamna Indo European people in Ukraine Russia area. Only some info was released in June 2013 they said the mtDNA haplogroups( Marker in Mitochondrial chromosome passed form mother to children) all had typical Caucasian groups so mid east and Europe with no Mongoloid groups. They had the same pale skin genes that dominate Europeans today and had the same phenotype as modern Europeans. Also that they had mainly brown eyes (probably also mainly brown hair) more than most modern Europeans but around the same rate as people in that area today. DNA from Indo Iranian Indo Europeans in central and eastern Asia some are 3,800 years old. Had mainly light hair and eyes and later remains had red hair and were shown to be very unrelated to mainly brown eyed Yamna people. Their ancestors never stepped foot west of Russia so they were about 100% from Indo Europeans that migrated east deep into Asia 5,000ybp. This shows that there were diff ethnic groups in Russia, Ukraine, north mid east area 6,000-8,000ybp who knows which one the proto Germanic Italo Celts were apart of. Since there is a lot of evidence red hair in western Europe comes from the spread of Germanic Italo Celts that would mean they were European and probably more related to the type Indo Iranians came from. Here u can see from the K12b aust. DNa test. That Gedrosian which is a off branch of west Asian fro their test and very popular around Iran, Pakistan, and north India. It seems to match the distribution of R1b. From what I have read R1b is suppose to have originated around Iran and Pakistan. So that Gedrosian component stayed in heavily r1b people even when they migrated to west Europe. This shows probably what happened is a mid eastern R1b L23 people made there way to either Ukriane or southeast Europe some how got Indo Europen language maybe they already spoke it thenthey made their way to west Europe. They would have inter married with Europeans probably very heavily in Ukriane but stayed pure on the paternal side maybe because they conquered people groups in Ukriane. The people who spoke the ancestral language of Germanic Italo Celtic migrated probably from southern Russia and Ukraine to southeast Europe mainly around Bulgaria about 6,000ybp. They would have been dominated by R1b1a2a L23. From south east Europe they then migrated north and west and landed in central Germany by 5,000ybp. By this time they would have formed into R1b1a2a1 L51 and R1b1a2a1a L11. The Germanic Italo Celts had superior bronze weapons, a very aggressive culture, War like Gods, and other things gave them a huge advantage over the native Bell Beaker culture so they were able to conquer central Europe from 5,000-4,500ybp. This could explain why out of 31 Y DNA samples in west Europe dating from 7,000-4,725ybp non had R1b but two 4,600 year old ones from central Germany had R1b one was for sure R1b1a2 M269 which shows the Germanic Italo Celts had arrived and were already dominating. From what we know this is probably how R1b migrated. 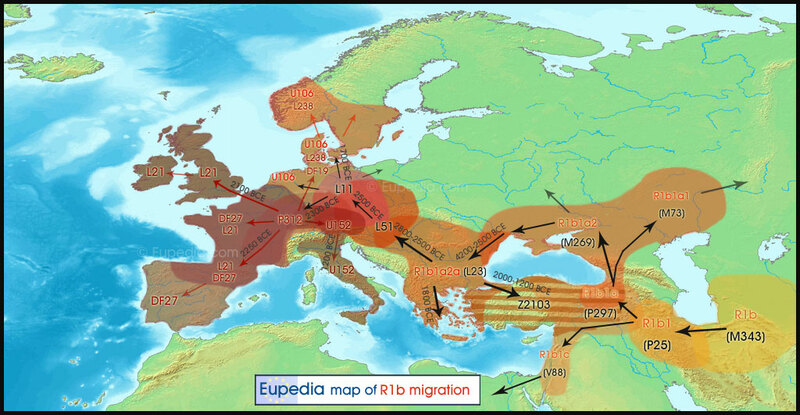 If u look at the R1b subclades i named above and find them on this map u can also see how Germanic Italo Celts migrated. Here is the R1b family tree it gives the people group or area it originated which helps. The Germanic Italo Celts with mainly R1b L11 and some R1b L51 from 5,000-4,5000ybp conquered the native Bell Beaker culture. Which before had dominated just about all of western Europe. About 4,500ybp they split into Italo Celts and Germans(dont get confused with the country Germany). The Italo Celts formed into R1b S116 invaded and conquered modern day central France, Alps, Austria, Switzerland, south Germany, and most of central Germany starting the Unetice culture about 4,500-4,300ybp. The proto Germanic speakers formed into R1b S21 about 4,500ybp conquered northern Germany, Netherlands then 4,000ybp conquered Denmark and south Scandinavia started the Nordic bronze age culture. Probably some R1b S21 people who would have spoken a Germanic language or a related language to Germanic in central Germany where conquered and mixed with Italo Celts. Map of Italo Celtic R1b S11/P312 some very early italo Celtic speakers mixed with proto Germanic speakers while both were in central Europe. So there are also Germanic branchs of R1b S116 but they are pretty rare. Like i said before the Italo Celts split from the Germans in modern day central Germany. Then migrated and conquered Alps, east France, and south Germany starting Unetice culture about 4,500-4,300ybp they also formed into R1b S116/P312 during this time. It is hard to say when Celtic and Italic languages split but Italic speakers were apart of the same cultures in central Europe with many Celts till 3,200ybp. The Celts made the first major migrations they conquered all of modern day France and the areas once ruled by Unetice by 3,600-3,300ybp forming into Tumulus culture which decends from Unetice culture. The reason it is called Tumuls is because they had so many Kurgen/Tumli burials which is a traditional indo European burial. The oldest Kurgens found are 6,000 years old one from southeast Poland the other north Caucus. The proto Insular Celtic speakers with R1b L21 migrated from Tumuls culture in modern day France and conquered Britain and Ireland somewhere between 3,000-4,300ybp. The book of invasions written by Irish monks in the 1000's ad. Say there were 7 major invasions of Ireland the last one was one by Irish ancestors who were Gealic Celts who conquered the Fir blog. This could be talking about Insular Celtic conquering of Irleand about 3,000-4,000ybp. The Insular Celts were split into two groups the Gealic's from Ireland and the Brythonic's who took up all of Britain. The Insular Celts were kind of isolated from the rest of Europe and there is not as much known about them as their is about Gauls and other Celts. They were seen by ancient people as being the most remote people in the world. There was alot of mystery mainly about the Gealic;s in Ireland. Multiple Roman writings describe them as sabotges who live in remote wilderness and that they painted their bodies with Blue and Green designs of Dragons and other Animals. Also Romans say the Picts who fought at Hadrien wall fought naked like Hallstat-La Tene Gauls in central Europe obvisouly some connection maybe it is a very ancient Celti or Italo Celtic tradition going back 4,000 years to Unetice culture. They copied alot of the styles in the Iron age of Hallstat-La Tene Gauls They also commonly wore Torcs which are bronze or Iron rings on the neck which were found in 3,500 year old Unetice remains in central Europe it is a unique Italo Celtic style. The inhabitants are equally mysterious. Cassius Dio speaks of Severus' campaign in northern Britain and the tribes of that strange land. They are a formidable adversary. "There are two principal races of the Britons, the Caledonians and the Maeatae, and the names of the others have been merged in these two. The Maeatae live next to the cross-wall which cuts the island in half, and the Caledonians are beyond them. Both tribes inhabit wild and waterless mountains and desolate and swampy plains, and possess neither walls, cities, nor tilled fields, but live on their flocks, wild game, and certain fruits...They dwell in tents, naked and unshod, possess their women in common, and in common rear all the offspring. Their form of rule is democratic for the most part, and they are very fond of plundering; consequently they choose their boldest men as rulers....They can endure hunger and cold and any kind of hardship; for they plunge into the swamps and exist there for many days with only their heads above water, and in the forests they support themselves upon bark and roots, and for all emergencies they prepare a certain kind of food, the eating of a small portion of which, the size of a bean, prevents them from feeling either hunger or thirst" (Roman History, LXXVII.12.1-4). Herodian writes, as well, of Severus in Britain. "Most of Britain is marshland because it is flooded by the continual ocean tides. The barbarians usually swim in these swamps or run along in them, submerged up to the waist. Of course, they are practically naked and do not mind the mud because they are unfamiliar with the use of clothing, and they adorn their waists and necks with iron, valuing this metal as an ornament and a token of wealth in the way that other barbarians value gold. They also tattoo their bodies with various patterns and pictures of all sorts of animals. Hence the reason why they do not wear clothes, so as not to cover the pictures on their bodies. They are very fierce and dangerous fighters, protected only by a narrow shield and a spear, with a sword slung from their naked bodies. They are not familiar with the use of breast-plates and helmets, considering them to be an impediment to crossing the marshes. Because of the thick mist which rises from the marshes, the atmosphere in this region is always gloomy" (III.14.6-8). "the home of men who are complete savages and lead a miserable existence because of the cold; and therefore, in my opinion, the northern limit of our inhabited world is to be placed there" (II.5.8). "furthest people of the world"
The Romans conquered the entire Hallstat/La Tene Celtic world but only the southern half of the Brythonic Insular Celtic world. The Brythonic Picts in Scotland and Geailic's in Ireland were never conquered by Rome but eventulley were conquered culturally and were converted to Christianity very quickly i think most people know the story of St. Patrick in Ireland. Gealic Celts from Ireland who were the Scots conquered the Picts and started the Kingdom of Scotland in the middle ages. Germanic tribes Angeals, Jutes, and Saxons and maybe others all coming from around Denmark, Netherlands, and northern Germany conquered southern and central Britain from 400-550ad. The western Roman empire was becoming weak and the Britons depended on Rome for military they had also lost alot of their identity. Many Insular Celts from Briton retreated into Britanny in western France which is why R1b L21 is so popular there. There were also invasions of Vikings from mainly around Denmark and south Scandinavia So all of these invasions lowered the percentages of R1b L21 in Britian. Map of the distribution of Insular Celtic R1b L21 before all the Germanic invasions in the late Roman period and middle ages R1b L21 would be as popular as it is in Ireland in all of Britain. It is unknown exactly when the proto CeltIberian speakers arrived in Iberia. What we do know is they would have had R1b Df27. This branch of Italo Celtic R1b P312/S116 is found in other areas because it probably originated in France but R1b Df27 for some reason became dominate in proto CeltIberian speakers. The only for sure time Celts arrived in Iberia. Is when Hallstat culture was expanding from central Europe and made was able to take most of Iberia by 2,700-2,500ybp. The CeltIberian name was given by a ancient Roman writer and the CeltIberians he was talking about were apart of Hallstat culture. CeltIberian is a continental Celtic language so it is most related to what Hallstat Gauls in France and central Europe spoke. But it also shows signs to be connected with Insular Celtic languages in Britain and Ireland. Celts could have arrived in Iberia either during the Bronze age 3,000-4,000ybp with Tumuls culture or in the Iron age 2,700-2,500ybp with Hallstat culture. Not all Iberians became total Celts. Many kept their native language but by the way R1b Df27 is dominate in all of Iberia today including non Indo European Basque speakers makes it seem like they were probably still Celts just not in language. map of CeltIberian R1b Df27 subclades M153(marker of Basque and ancient Aquitaine speakers basque are the last left), SRY 267. These are only two subclades of R1b Df27 basically almost all R1b in Iberia is R1b Df27. Tumulus culture around the alps, South Germany, and east France formed into Urnfield culture. Urnfield culture became very dominate amoungst other Italo Celts. The Urnfield culture was able to spread their culture by force and trade throughout most of central Europe. They were dominated by R1b S28 they may be were R1b S28 originated. It lasted from 3,300-2,750ybp It gave birth to Celtic Hallstatt culture in central Europe and Italic Villnoeaven culture in northern Italy both were dominated by R1b S28. Urnfield weapons and armour from north Italy i would assume around 3,000 years old. 3,000 year old Hallstatt Celtic bronze sword as u can see it is nearlly identical to the Urnfield sword from Italy. They are the R1b S28 Italo Celtic sword. 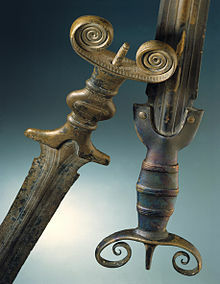 These are the types of swords Italic and Celtic Cheifs and high ranking warriors used to spread R1b S28 and cultures descended from Urnfield culture. The R1b S28 Celts and Italics descended from Urnfield culture in my opinion are some of the greatest warriors and conquers of all time. Urnfield also gave birth to Hallstatt Celtic culture which started in the area Urnfield and Unetice culture originated. Hallstatt spread across all of modern day France conquering other Celts mainly culturally but also by military. It could have been Celts in southern and western France who spread into Iberia with R1b Df27 from 2,700-2,500ybp. Hallstat culture gave birth to La Tene culture around the same area Unetice, Urnfield, and Hallstatt culture were founded probably because that was the center of the Italo Celtic world. Hallstatt and La Tene culture were able to spread acroos the entire Celtic world, north east Italy, alot of land in eastern Europe just north of the Balkans and in central Turkey. Map of Urnfield Italo Celtic R1b S28. Like i said before it was spread by Celts and Italics descended from Urnfield culture starting in central Europe around 3,500ybp. It was spread by conquest and trade mainly conquest. The Hallstatt Celts in The alps, France, and south Germany had constant contact, trade, and wars with Villnoeaven Italics in Italy. Which could explain why both started to use Iron around the same time. The R1b s28 Italic tribes who eventualley conquered just about all of Italy. Were heavily influenced by Greece and other Mediterranean civilizations like Estrucans who seem to have conquered most of central Italy about 3,500-3,000ybp but orignally came from somewhere in the middle east. The City Rome in Italy was founded in 753bc in Villnoaeven culture. Romans were a city state and had to slowly win over Italy from other Italic's, Celts, and Estrucans. Early Roman writing talks alot about wars they had with invading Hallstat/La Tene Celts who conquered much of northern Italy. What surprises me is they describe Hallstatt/La Tene Celts as complete foreigners even though they came from the same father culture but that is probably because of how much Italic's changed from Greek influence and they had been separated from the Celts culturally for over 500 years. Rome had lost alot of their Italic traditions and became like Greeks but they did not completely forget their old traditions. Ancient Roman writers wrote alot about how Rome had left their more simple ways and became like Greeks so they rembered who they used to be. Rome was able to conquer Italy from other Italic's, Celts and Estrucans by 218bc. Eventulley they became the powerhouse of the Mediterranean world conquering all land that borders the Mediterranean sea. Then went on to conquer the Hallstat/ La Tene Celtic world, Balkans, Greece, Dacai-Thracia, and much of the middle east. The Romans probably had the most dominate and greatest military in history. It is true they had left most of their Italic traditions and became like Mediterranean civilizations but in military they thought of themselves as separate and tried to keep their traditions. Their main sword the Gladuis was invented by Hallstatt Celts in Iberia, their chain mail was invented by La Tene Celts from central Europe in 300bc, their main helmet also by La Tene Celts in central Europe. So alot of their military equipment was from Italo Celtic technology not Greek and Mediterranean. Rome in many ways created modern Europe and the western world. Everything that has to do with civilization in modern Europe came from Rome well before Rome Greece. Map of farthest extent of Roman empire in 117ad. Modern people from around Rome dressed in exact same equipment as the soldiers who expanded the Roman empire wore. Since at least in early times of the Roman empire most of all the soldiers came from around Rome or were Italians. Their main Y DNa haplogroup would defintley have been R11b S28/U152. Their sword's, chian mail, and helmets all came from Hallstat-La Tene Celts whick orignalley formed out of R1b S28 Urnfield Italo Celtic technology not from civilizations around the Mediterranean. 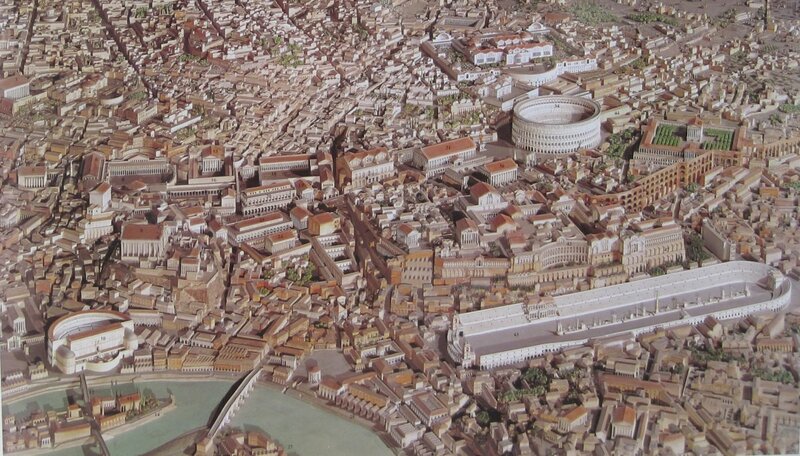 Reconstruction of what the nicest part of Rome would have looked like in its glory days. It shows how powerful they were. Rome is probably the most powerful civilization in human history. Last edited by Fire Haired; 09-01-2013 at 04:17 AM. Map of total Germanic Paternal lineages. While Germanic speakers migrated accroos central Europe 4,000-4,500ybp they mixed with the natives and got some I2a2 and I1a subclades. When they conquered south Scandnavia 3,500-4,000ybp they spread I2a2 and got alot of I1a2 and some R1a Z284. So during Iron age Germanic migrations they did not just spread R1b S21 they actulley probably spread more I1a and I2a2. This map combined all R1b S21/U106, I1 except subclades of Finnish origin, I2a2a M223, and R1a Z284. I think it is kind of un accruate because all of those haplogroups except R1b S21/U106 orignated in non Germanic speaking people that Germans later conquered and mixed with. So alot of I2a2a M223, non finnish I1, and R1a Z284 was not spread by Germans. R1a Z284 came from proto Balto Slavic speaking Corded ware culture thatsruled souther Scandnavia till Germans came 4,000-3,500ybp. Almost all non finnish I1 in Scandnavia was there before Germans and same with I1 in central Europe. It seems German speakers stayed in the areas they originated until around 700bc. There defintley was some R1b S21 in central Germany before this. That could mean there were people who spoke a related language to German, spoke a Germanic language, or were R1b S21 people conquered by italo Celtic cultures. Prove in my opinion is 3,000 year old R1b sample from Urnfield culture in central Germany. I put its haplotype on a bunch of online haplogroup predictors all that had R1b S21 as an option said it was for sure R1b S21. Here is a map that kind of shows the major Germanic migrations starting around 700-500bc. The Germanic tribes started to have alot of contact with Hallstatt/ La Tene Celts. They traded and had wars it seems the Germans were winning most of them since they were taking Celtic land. 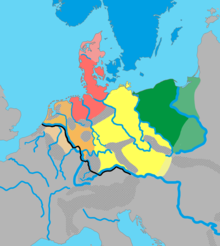 Germanic tribes also migrated east into Poland. The east Germanic speakers Vandals and Goths ancestors migrated from southern Scandinavia mainly Sweden to Poland first around 200bc. 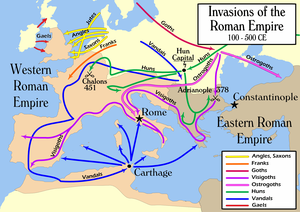 Germanic tribes migrating south also came in contact with Rome which resulted in a war with Rome from 109-100bc. The Cimbri, Teutons, and Abrones from Denamrk. Were making big migrations in Gaul defeating the Gauls in many battles they migrated acroos western Europe very quickley and raided even as far west as Iberia. They beat Rome in most of the battles but were not able to actulley take the city they were defeated while trying to get to Rome through Italy and all those tribes went extinct. The Germans were able to take alot of land in Europe by 1ad. Rome was in the Germans way from taking more land. Rome had just conquering all of western Europe except Germanic areas, Scotland back then it was Pictland, and Ireland. Rome had such a organized, equipped, and powerful empire there was almost no way Germans could take any of their land or even attempt to. In 16bc some Germanic tribes around the border of Rome had major victories agianst them. So in response Rome conquered alot of Germanic land. The Romans were very harsh on the Germans they ruled and tried to make them Romanized and stop their old tradtions. This Got other Germanic tribes very angre which resulted in the battle of Teutoburg foreast in 9ad which Germanic ambush and a major Roman defeat. Rome was never really able to conquer alot of Germanic land and did not see a good reason too. Germans and Romans were always fighting back and forth with each other. From 1ad-370ad east Germanic tribes Vandals and Goths were able to conquer just about all of non Roman Europe which could explain why R1b S21/U106 is found at around 1-5% in most of eastern Europe today. The people they conquered were mainly Slavic tribes and Indo Iranian tribes specifically Sycthains and Sarmatiens who had migrated there from central Asia hundreds of years before. The east Germanic tribes people would have been mainly from the native people they conquered and they mixed cultrally with the people they conquered. The Huns who were a Turkic tribe from Volga Russia original they came from eastern and central Asia. They conquered and ruled just about all Germanic land except northern Germany, Netherlands, Denmark, and southern Scandinavia from 370-469ad. The Roman empire mainly the western Roman empire had weakened alot by the 300-400'sad. The Huns also beat up on Rome and Rome had to give them some type of payment for the Huns for them to leave when ever they invaded. The Huns stayed in Germanic folklore for a very long time people descended from Germanic tribes in the middle ages wrote alot about the Huns.The Huns were apart of a bigger thing in history called the migration period which was Hunnic and Germanic migrations in Europe. Last edited by Loki; 08-12-2013 at 12:07 AM. Something to remeber is the R1b map includes all R1b not just Germanic Italo Celtic R1b L51 and L11 subclades. Almost all R1b in western Europe are in those subclades but not all. When comparing the two map only count the R1b in western Europe. There defintley is a connection with these two maps. Eupedia has not yet made a Germanic Italo Celtic R1b L51-L11 and subclades map yet but i gurentte it will be almost a perfect mach. I attempted to combine the Germanic R1b S21/U106 map with Italo Celtic R1b S116/P312 map i could not make it perfectly accurate but while doing it i was shocked from its connection with the red hair map. Alot of people assume red hair is everywhere in Europe but it really is actulley unque to a part of central Russia and western Europe. 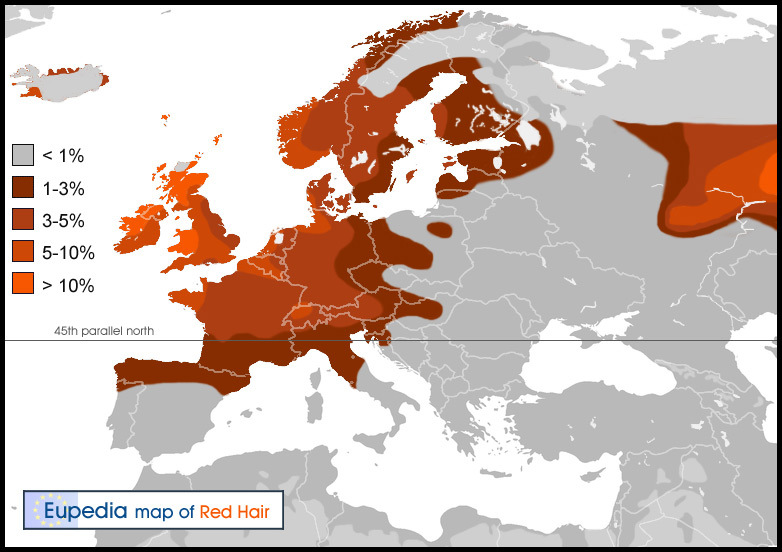 Red hair does exist in very small rates throughout Euroe but the only areas were it is 1% or more are on this map. R1b orignally came from the middle east and Germanic Italo Celtic R1b L51-L11 father's pretty much all originated around Anatolia and the Caucus mountains. So it is not like R!b holds the key to the origin of red hair when mid eastern R1b came up to Russia and Ukriane they would have mixed with red haired people who then got R1b paternal lines. The Indo Iranians who form a branch of the Indo European language family tree and Y DNA their branch is R1a1a1a1b2 Z93. They migrated out of central Russia into Asia starting at the earliest about 5,000ybp. They also had pretty descent amounts of red hair the why we know this is 3,000 and 3,400 year old mummies of Indo Iranians in west China had red hair. There were no groups of European people they could have inter married with during those other 2,000 years in asia so probably means the first ones had some red hair. 3,800-3,400 year old Indo iranians remains from Adrnovo culture and later Indo Iranian remains not counting the ones in China all had mainly blonde hair and light eyes out of 11 hair color samples they all had either blonde or brown hair but it is only 11 even if they were Irish u should not except to get any redheads from 11 samples. The ancient Sycthians who were a Indo Iranian tribe that dominated central Asia till about 2,000ybp they were very well known for red hair by ancient writers. Red hair today still exists in the area of west China were there was heavy settlement by Indo Iranians 4,000-5,000ybp. Also red hair does pop up in modern Indo iranian ethnic groups like Kurds in Turkey, Iraq, syria, and Iran, Kalash in Pakistan, Pashuten in Afghanistan there is no doubt red hair was some what popular in the Indo iranians that migrated out of Russia 5,000ybp. So that means a Indo European group that migrated from around the same area as Germanic Italo Celts did have red hair. That means it is totally possibly Germanic Italo Celts had red hair and spread it in western Europe. There were also other ancient people known for red hair the Thracens and Dacens who lived around modern day Bulgaria and Romania were very well known for red hair by Greeks. 2,900 year old Greek poem described Thracens as like the opposite of black skinned Ethopians they said the Thracens were red haired and blue eyed. I have not meet that many Romanians but two of the Romanians i have meet had red hair it defintley exists in that area but who knows it may have been more popular in ancient times. The Thracens and Dacens were iNdo Europeans but exactly were they migrated from or what their Y DNA markers are is not completly known. It seems they may have come from the same R1b l23 migration into southeast Europe as Germanic Italo Celts but Germanic Italo Celts split and migrated to western Europe about 5,000ybp that may be why there was red hair in Thracens and Dacens. It is defintley debatable but in my opinion there is no doubt red hair in western Europe is from Germanic Italo Celtic migrations. The complete origin of red hair is much more complicated and much older. Probably the reason why red hair is more popular in Denmark than Spain even though both areas were conquered by Germanic Italo Celts. Is because the native Danish would have been mainly blonde haired and light eyed while the native Spainish would have been almost only dark haired and eyed. Red hair has a better chance of popping up in a light haired group of people because it is a light hair color and dark hair genes are more dominate. When i say red hair i dont mean albino red hair or strange unrelated genes that cause red hair in Papaue New gunie people or the red hair in neanderthals. Since red hair is so recessive and rare it is hard to tell exctley how it is distributed and how old just because it is rare does not mean it is young. Red hair pops up in the Kablye people in Moorco one of the biggest ethnic groups in all of Africa. The Kablye people live in mountains in Moorco right next to the border of Spain and are known by other north africans as the pale skinned people some sub groups of Kablye have 18% blonde hair so there is obviously some European blood it is hard to say when it came but it most likely very long time ago thousands of years ago. Also the Smartiens in Palestine and Isreal sometimes have red hair, whte skin, and freckels it is ligit red hair caused by the same genes as red hair in western Europe. The Samartiens are mentioned in the Bible they split from Jews and the Faith and mixed with Gentiles they only marry each other and have done that for over two thousend years. There are only 700 left and there have been Aust DNA tests on al of them not one has a drop of European blood. So who knows red hair might have a very ancesnt origin in the common ancestor of Europeans and mid easterns over 50,000ybp. Last edited by Fire Haired; 08-10-2013 at 02:37 AM. 1stLightHorse thanks for the complement about my post. Your Y DNA haplogroup I2b1 is now called I2a2a and the names keep changing the more we learn. The part that does not change is the M223. Since u are from Austraila i would assume ur ancestry and direct paternal line go back to the British isles. The British isles have a unque subclade I2a2a1 M284 it is estimated to be about 3,000 years old i bet that is what u have. I2a2a people in central Europe were conquered by Germanic Italo Celts from 5,000-4,000ybp then they mixed and Germanic Italo Celts also spread alot of I2a2a M223 that is why Eupedia added it to the Germanic Paternal lineages map. If u have the British type I2a2a1 M284 ur direct paternal line was either brought over by proto Insular Celts from Tumlus culture around 3,000-4,000 or it formed from I2a2a M223 which was already in the native people in the British isles. The age is a thousand or hundreds of years after Insular Celts invaded so i think that is probably were it comes from. If u dont have the British type it could still have spread the same way as I2a2a1 just it is some of the last original forms or it could have been brought over by Germanic invasions from 400-550ad or Viking invasions. The Eupedia page about I2 says I2a2 P214 might be 13,000 years old. Age estimates are really hard to get right and u cant always trust them they uselly do give basic idea's of haplogroups age's. All we know is that I2a2 P214 is started in either Neolithic or Mesolithic-Paloithic Europe probably somewhere in central or western Europe. My guess is it is around 13,000 years old or more and I2a2a is also very old it takes up 90% of I2a2. It decends from Y DNA I that originated in either Europe or the middle east maybe around 30,000-40,000ybp. It seems like Y DNA I repopulated Europe after the last glacial maxmum which ended 19,000ybp. Yes you're right, my lineage is British isles. My surname (not that common) reaches its highest frequencies in Gloucestershire (and not much anywhere else). Apart from it's frequencies in Australia, USA, Canada, New Zealand, etc etc. Fire haired, what about R1b Germanic italo Celts and testosterone production?? Weren't there studies indicating that R1b carriers produced more testosterone and a higher sperm count, therefore predisposed to produce male offspring? Also, more likely to show high levels of assertiveness, competitiveness and disagreeability? I think i remember also a Pakistani study suggesting that haplogroups R1a and R2 among pakistani children displayed more signs of 'aggression' than did their peers from other haplogroups found in Pakistan. I have heard of studies saying R1b men are more agressive and that Y DNA haplogroup might effect testosterone production. I have also heard about those studies in India. I really doubt them. Also doesn't everyone have almost unlimited sperm so does that really matter. I have read on Eupedia R1b page that Y chromosome has to do with amount of sperm production and chances of having boy's and that R1b might be one of those haplogroups that has better chances for that. I doubt people with diff Y DNA haplogroups naturally are more aggressive. Because then u would see for example all western Europeans since they are dominted by R1b would show obvious higher agression than for example north Africans dominted by E1b1b. All men are made to be aggressive and competitive they are major natural traits in guys but the way someone grow's up can affect how much he uses that natural aggression. There is no doubt some people naturally are more agressive than others naturally but i doubt y dna haplogroups have anything to do with it. Y DNA R1b has been in Europe for a very short time it migrated through the north mid east to the caucus and to Russia just 6,000-10,000ybp. Then it spread with Indo European languages. Y DNA R1 period was orignally Mongliod not Caucasian at all it orignated around central and eastern asia. There are some native Americans and Siberians who have the orignal form of R1* but no one in Europe or the mid east does. Y DNA R is the brother of Y DNA Q the dominate haplogroup of central Siberians and Native Americans. Y DNA R2 has nothing to do with Indo Europeans it is the brother of R1 and stayed in central asia. The R1b L51-L11 Germanic Italo Celts defintley were very agressive that is a big reason they eventulley conquered all of western Europe. I doubt their aggressive culture had anything to do with their Y DNA haplogroup. Indo European cultures began around Russia, Ukriane, and north caucus 6,000-8,000ybp then began to spread into Europe and central Asia 5,000ybp. They dominated and conquered everywhere they went Indo European culture period is war like does not matter of they had R1a or R1b. I never said R1b was proto Indo Europeans it probably orignated in Iran 18,000ybp. Then it migrated and formed into new subclades in the middle east and made it's way to the Caucus and Russia around 6,000-10,000ybp. It became very popular in some people who were apart of early Indo European cultures 6,000-8,000ybp then spread with Indo European languages. 6,000-8,000ybp - includes PIE. This date is earlier than Corded Ware, for example. R1b comes from Bell Beakers in Europeans, not original IE speakers. If the other way round were truth, you would see R1b in Balto-Slavs, but they are dominated by R1a. Not exactley true proto Germanic Italo Celtic L51 does not come from Corded ware culture they took a diff migration route than Balto Slavic R1a1a1b1. Germanic Italo Celtic R1b L51 is the cousin to southeast European and west asian R1b Z2103. It is also the grandson to R1b l23 which is mainly around turkey and southeast Europe. R1b L51 is estimated to be less than 8,000 years old the age estimates of western European R1b subclades show it came in a recent migration around the time Germanic Italo Celtic languages came. Also the subclades break down into language groups it all comes together perfectly. There are 31 Y DNA samples from western Europe their age ranges from 7,000-4,725 years old not one had R1b or R1a. Then two 4,600 year old Y DNa samples from central Germany bell beaker culture the exact spot and time Germanic Italo Celts first arrived both had R1b one was for sure R1b M269. The Bell Beaker R1b and other Y DNA from Neolithic western Europe totally defend the idea about Germanic Italo Celts bringing R1b to western Europe. Bell Beaker decended from earlier non Indo European Neolithic cultures that traced back almost 8,000 years there is almost no way they are the source of R1b in western Europe. Bronze and Iron Age remains in Thanet, Kent. Uralic in N. Europe = Mesolithic vs. Bronze Age vs. very late arrival to Europe??? ?